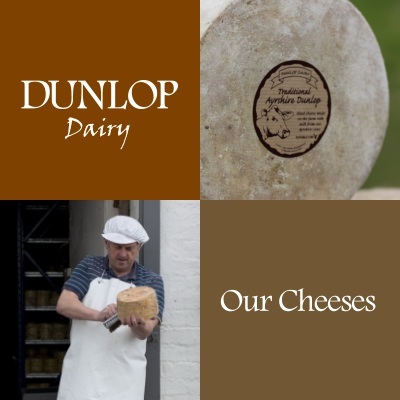 Dunlop Dairy - Our Cheeses - Traditional Ayrshire Dunlop Cheese and other scottish hard and soft cheeses. Robert Burns was gifted one of these Ayrshire cows from Mrs Dunlop of Dunlop. "the finest quey in Ayrshire"
We use vegetarian rennet which allows all the cheeses to be suitable for those of you who are vegetarians. The cheeses are made mostly from pasteurised milk. We are developing some more exciting cheeses so keep a look out for them. Traditional Ayrshire Dunlop is a hard-pressed cheese not unlike cheddar but more moist. When young it is mild with a nutty flavour and smooth, close texture. As it matures it develops a good strength with a slight sharpness. Mild at 6 months maturing to 12 to 14 months. This cheese is named after the nearby village of Dunlop. Nowadays the name Dunlop is generic so the cheese can be made anywhere and called Dunlop. “Traditional Ayrshire Dunlop” indicates it is made in the original area around Dunlop and with the milk from Ayrshire cows. The making of Dunlop cheese dates back to the 1700s when Barbara Gilmour, a farmer’s wife started making a cheese at the Hill Farm Dunlop (about a mile from us here). She brought back, from Ireland, the recipe which uses whole milk. Previously skimmed milk was used for cheesemaking. This whole milk recipe created a superior cheese and eventually Dunlop became as well known as Cheshire or Wensleydale. Not only is Dunlop famous for its cheese but the Ayrshire cow was first bred in the parish where it was formerly known as the Dunlop cow. This cheese is in the final stages of applying for PGI status. If successful Traditional Ayrshire would be a protected cheese which means it needs to be made in the area around Dunlop, with milk from Ayrshire cows and using the same traditional methods. The cheeses are smoked over Beechwood at the local Fencebay Smokehouse. Fencebay have been smoking quality food products ie salmon and trout etc for years so we use their expertise and experience to smoke our cheeses for us. Aiket is a soft, white, mould- ripened cheese (brie, camembert style) again made from our Ayrshire cows’ milk. When young it is firm with a chalky texture and fresh mild taste. The white mould growing on the surface ripens the cheese from the outside in to the centre. As it does this, the texture becomes smoother and creamier and it develops a rich almost mushroom flavour. It is a personal preference whether it is eaten young or fully ripe. The name Aiket meaning oakwood is a local name. Paddy’s Milestone is our newest cheese - totally unique and beautifully packaged. It is a white, soft, fresh cheese shaped like a rock (hence the name) with a creamy texture and delicate irresistible flavour. These weigh at slightly under 200g. Clerkland Crowdie is a soft fresh cheese – rich and creamy with a sharp tang. This is a very versatile cheese being suitable for cooking, ideal for topping carrot cake, in cheesecakes, on a biscuit or bread with smoked salmon or in pates etc. It is a fresh cheese with no preservative so has a short shelf life of 14 days so buy little and often. Sizes – 100g rolls or 2kg tubs. Other quantities can be made to order. Available in little logs rolled in oatmeal and black pepper or plain (add your own choice of herbs etc). A hard pressed cheese made from our Saanen and Toggenburg goats’ milk. Well-known and extremely popular Bonnet is named after our local town of Stewarton, ‘The Bonnet Toun’. The mills in the town made bonnets for the army regiments. Matured for 6 to 10 months. Sizes: 3kg whole round or prepacks. This cheese is shaped like a rock and wrapped like a little parcel. Creamy taste with a hint of goat, melts in the mouth - delicious. It is named after the famous rock in the Firth of Clyde. A soft white mould ripened cheese is ripened similarly to the Aiket. Fresh and chalky when young and develops a much more goaty flavour with a smooth creamy texture when ripe. This cheese is ideal grilling or for little starters. Sizes: log of 130g or 250g approx.